30 Years in the Game! 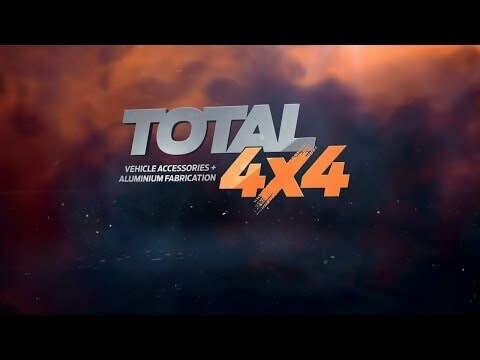 Total 4×4 is the one-stop shop for all your truck, passenger and 4WD accessories with over 30 of experience. If you love a bit of 4×4 action – look no further! We are Western Australia’s leading four wheel drive equipment supplier. We’re proudly setting the standard for 4×4 accessories and off-road equipment in Perth with a wide range of new and exciting 4×4 products and customer service that exceeds all expectations. We offer a diverse and adaptive range of 4WD and outdoor products, including canopies, bull bars, winches, spotlights, roof racks, suspension, airbags, snorkels, single wheel carriers, twin wheel carriers and battery trays. Aluminium is an extremely durable material that can be used in many ways to customise a wide selection of vehicle types – and it looks great too! Speak to us about your specific needs and we’ll get it done with premium quality at our sophisticated Aluminium Fabrication Facility. Whether it’s for a roof rack, bull bars, bike racks, spare wheel or modified tray backs, Total 4×4 can do it, and do it well. Mining sites can be dangerous and any vehicle entering such an environment needs to meet strict safety criteria in Australia. We can implement and install these requirements with mining site vehicle fit-out at our workshop. Furthermore, Total 4×4 can help with customised government or fleet requirements that meet specific needs across a number of vehicles. This includes anything from safety specifications to roll over systems and suspension upgrades to the latest 4WD equipment and gadgets with exceptional customer service and strict deadlines. As an extension to our growing list of equipment and services, Total 4×4 is now a supplier and installer of solar products. We recognise the benefits of clean energy and feel it is our duty to help wherever we can in conserving our natural world. Have a look at our extensive range of off road equipment and accessories that can be tailored to your specific needs and vehicle type. We stock everything from bed extenders to electrical components and fuel/water tanks to air springs and awnings. Total 4×4 covers distribution in Perth and throughout Australia, with Mine Spec, Government and private fleet fit-outs done at our centrally located workshop at 92 Beechboro Road South, Bayswater, WA. To place an order for four wheel drive parts & accessories or get some expert advice, please contact us now or call us directly on (08) 9271 6898. Just a short note to convey a big “Thank you” for the work done. The job-sheet for our 4WD was rather extensive. 2nd Battery, Snorkel, Ali-Bullbar, Long-Rang Fuel Tank, Rear Heavy Duty Rear Springs with Airbags, Spotlights, UHF-Radio, Winch, Additional-Rear-Camera, Aerials, Roof-rack, 15amp plugs, Solar Fittings, Electric-Braking and much more. All been of high quality brands been fitted. This will allow us to continue our 30years of 4wd experience and adventures off-road with ease, making the trips much more than just a bush tracks and beaches, by having with the right equipment fitted for the job, that looked very professional. We had heard they would be of top quality workmanship, that was an understatement. The highlight was the very helpful and obliging friendly approach offered to us by Wayne Pearce and his colleagues, all with the willingness to listen to our personal needs and forefilling them for us. It was like a real genuine family friendly atmosphere. Thanks again to all involved. 20 out of 10 guys! Well done..
Max & Penny Stickland Mt Helena. W.A. I have been accessing the Total 4×4 web page in the past months to search for various items and accessories required for building our new Standard Accessory listing and I would like to congratulate you on the easy yet effective layout of the webpage. Total 4×4 have managed to provide a huge variety of listings and availability of items related to the vehicle industry. I am especially impressed with the detail associated with obtaining the correct specification’s and the search process. Total 4×4 help get a great bull bar fitted to my pajero. Mick was very accommodating and I am real pleased with the end result. They are a great firm to deal with…. Total 4X4 have done a magnificent job fitting out my new Prado Kakadu with a bull bar, tow bar, dual battery and electric brakes. Mike’s assistance in specifying and sourcing the best products for my car was excellent and the before and after service provided by the rest of the gang was outstanding.I will be recommending Total 4X4 to all my friends and colleagues.